No matter what is going on in your life you are surrounded by blessings, you just have to look for them. Don't worry this isn't a post that is intended to make you feel guilty for not appreciating what you have. I just think we sometimes forget that even during rough times, we are still being blessed. Perhaps not the way you intended, but the blessing are still there. Last night I had my kids try on last winter's clothes. No surprise, not a single item of clothing that they wore last winter still fit. Molly's jeans fit everywhere but the length. I measured, they are 3 inches too short. How is that even possible? Up to the attic I went to retrieve our bags and bins of hand me downs. Over the years we have been extremely blessed with friends and family who give us hand me down clothes. 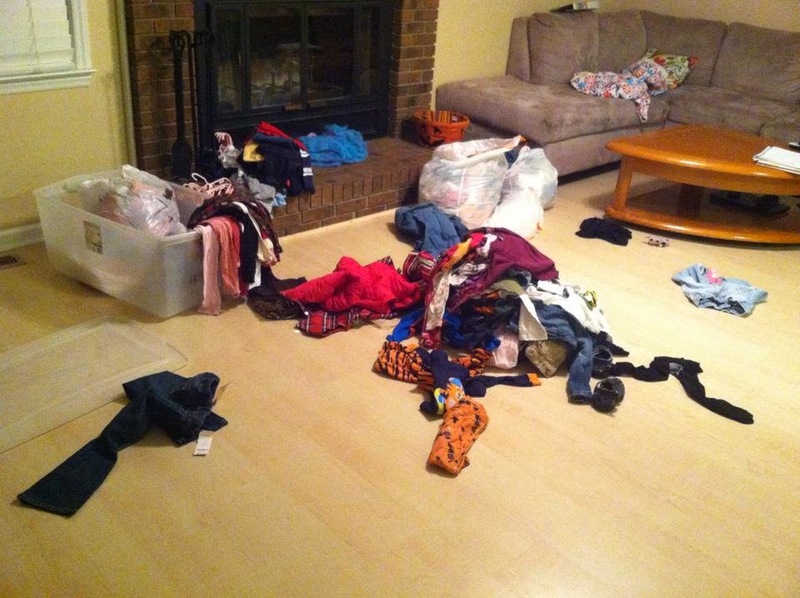 Every season I am filling in the gaps of what is missing or needed in my kids' wardrobes. Typically I need to buy dresses since my girls love dresses and we don't get very many handed down. Of course having two girls means Isabella's clothes go to Molly. They are currently one size apart which is surprising since they are 2 years apart. I actually missed a bag so this isn't a true picture of my blessing. I went through the clothes last night and pulled out all the winter stuff in the next size and determined the gaps for each kid. Mark needs a 3-4 hoodies and socks. We always buy socks new, he just happens to need them now. Molly needs a new jacket and a 3-4 long sleeved shirts. The jacket Isabella wore at 5 doesn't fit Molly's arms at 4. Isabella needs 1 pair of jeans and all new leggings. All 3 kids need gloves. Seriously how amazing is that list? It's like this every season and I still don't take it for granted. I know some people think it's too much work to store and organize clothes. But I have an easy system that works for me. I bag everything by size and store them in plastic bins. Besides this picture represents hundreds of dollars worth of clothes. Two of these bags are for the next size for Mark and Molly so they are set to grow. Last night I did 4 loads of laundry and took the time to put away most of the summer clothes. I can't put away everything since it's still warm here. I hate the window where it's cool one day and blazing hot the next day. It took hours between having the kids try on clothes and washing and folding everything but it's done and worth the effort. When it comes to clothes I have a pass it on mentality. I find friends to give the outgrown clothes or donate them to so the cycle continues. I want to bless other people the way they have blessed me. My challenge to you is to take a moment today and find one way that you have been blessed. I'm sure you'll realize that there are many blessing in your life that you look at but don't really see. Perhaps your neighbors agreed to carpool to soccer this year. Or maybe you have a friend who will drop everything for you when you need it. Whatever your blessing is, think abut how different your life would be without it and give a little thanks. What are some of the blessings you see?